How’s this for irony? While we’ve been worried about Seattle becoming the next San Francisco, it turns out other cities have been worried about becoming the next Seattle. That’s right. “Seattle-ization” is a thing now, at least according to a New York Times article published last week. It’s described as “a particularly dire diagnosis,” and characterized by high housing costs and tech wealth, a combination that’s thoroughly transformed the city in an alarmingly short span of time. Even in New York City, apparently, some folks are terrified that the planned Amazon campus there could turn the place into “Seattle on steroids,” according to Vice Magazine. It’s a little unsettling to find out we’ve become other cities’ worst-case scenario. But it’s also understandable, when you consider not just how expensive Seattle has become, but how quickly it happened. 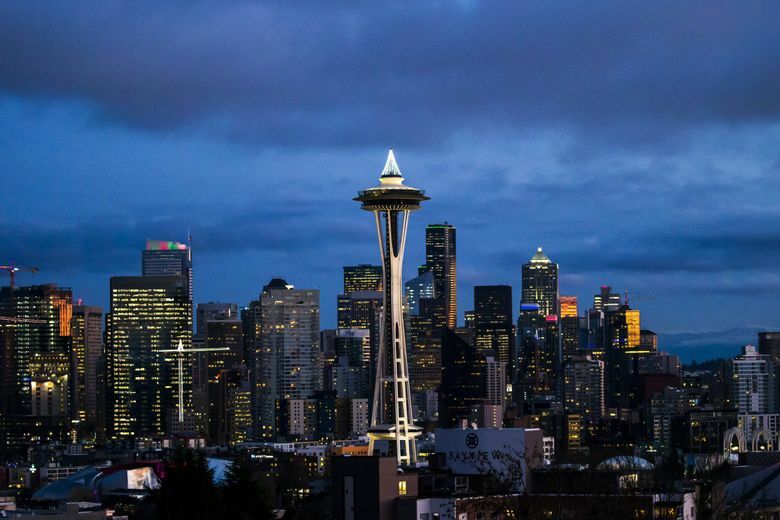 In 2013, when census data showed that Seattle had suddenly become the fastest-growing big city in the nation, it seemed to come from out of the blue. Of course, that turned out to be just the beginning. But think back to right before then, in 2012. Amazon had consolidated its workforce in South Lake Union only two years earlier. The gears were already in motion, but most of us were oblivious to the tidal wave of change that was about to hit. I guess we thought of Seattle as a fairly expensive place to live back then, which is a little funny in retrospect. 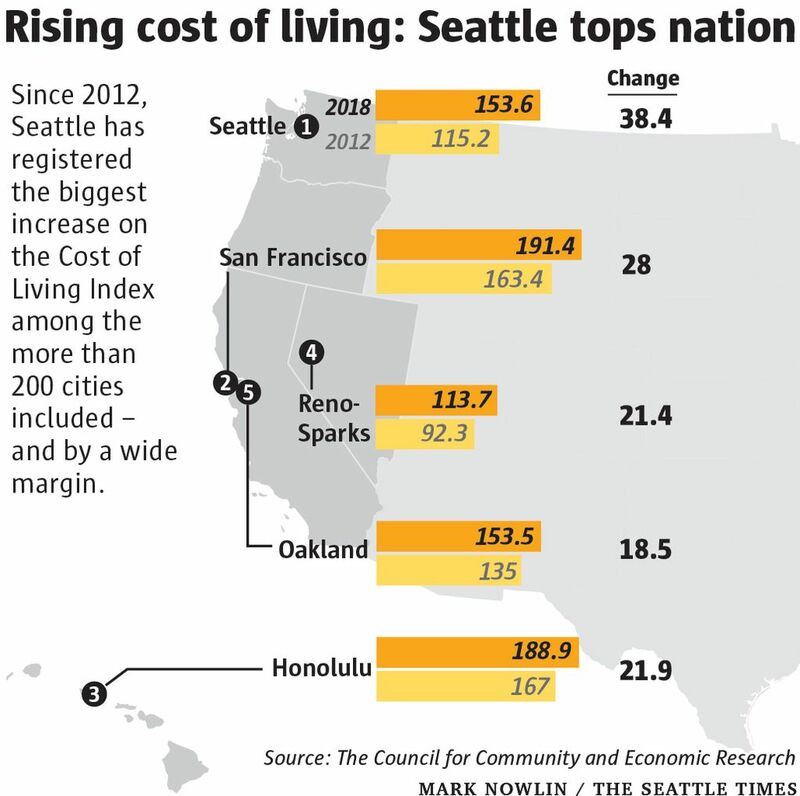 That year, the Cost of Living Index scored Seattle at 115.2, which meant that living costs here were 15.2 percent higher than the national average (100 is the index’s average). That score ranked Seattle 35th among the more than 300 cities included in the index that year. We were just about tied with Portland. A few of the cities that had higher living costs than Seattle in 2012: Sacramento, Philadelphia and Anchorage, Alaska. The most recent Cost of Living Index release, for the 3rd quarter of 2018, pegs Seattle at 53.6 percent above the national average. In just six years, our index score jumped by about 38 points. No other city comes close to matching that. We’re now firmly established as the sixth most expensive place to live in the country, according to the index, a mark we first hit that at the end of last year. And yeah, we’ve left Portland in the dust, even though the Rose City is also in the top 10, with a 13-point gain in its index score. The Cost of Living Index is published quarterly by the Arlington, Virginia-based Center for Regional Economic Competitiveness, a nonprofit research and policy organization. They’ve been producing city-to-city cost comparisons since 1968, collecting data at the local level on prices for more than 60 goods and services in six major categories: housing, health care, transportation, utilities, grocery items and miscellaneous goods and services. No one will be surprised to learn that of those categories, housing here has seen the most precipitous climb. In 2012, our housing costs were about 35 percent above average. Now, they’re 113 percent higher. Because housing is most people’s No. 1 cost, we tend to focus on it. But almost everything in Seattle is much more expensive than it used to be. In each of the index’s six categories, Seattle’s score has gone up. We rank toward the top for the price of nearly every good and service included in the index. From cooking oil to car repairs, from a trip to the dentist to yoga classes, you’re paying a premium to live here. In 2012, we were actually below the national average in one major category: utilities. In the most recent data, we’re 10 percent above average, which is still a bargain compared with everything else. In so many ways, Seattle is an amazing success story, thriving and economically vibrant, drawing thousands of people from around the country and the world. When you think about the great American cities that have fallen on hard times, that are losing population and dealing with epidemics of violent crime, Seattle seems enviable. But we’ve also paid a hefty price for our success. The sudden injection of tech wealth has made Seattle a more exclusive place. It’s exacerbated inequalities, pushing people out of the city or even into homelessness. Rapid growth has taxed our infrastructure, and the debate over where to house all these new people has divided the city. It’s enough to make you consider towns at the other end of the Cost of Living Index. The city that’s seen the biggest drop in its index score actually went from having an above-average cost of living in 2012 to one that’s well below average today. And that’s not the only way in which it’s the opposite of Seattle, because, according to the World Meteorological Organization, it also happens to be the sunniest place on earth. Down nearly 14 points on the Cost of Living Index, that city is Yuma, Arizona.